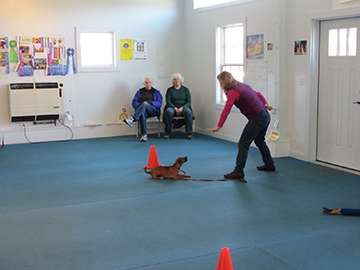 While working with a private client and her pup this week, she repeated herself many times by saying, “she is so smart”, “I had no idea my dog was so smart!” The funny thing is, I hear this from many clients when teaching their dog a new behavior. 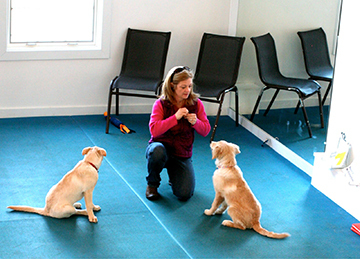 When pet owners learn to teach their dog new behaviors using positive reinforcement, their reaction is always, always, the same: “I had no idea how smart my dog was!” The only thing they did differently was quickly rewarded the dog when it made the right choice, then repeated the reward when the dog did the correct behavior again. We were able to teach her puppy to touch her hand with its nose and to lie down, in a matter of minutes using the pups mid-day meal. Seeing how happy this owner was, and how quickly she became more connected to her pup, reminded me once again how effective positive reinforcement training is — both for the dog and owner! I love this photo! Not because the terrier is absolutely adorable when rushing at the Shepherd cross but because no one told him she was part “wolf”. He has no worries and simply wants to Play! Both dogs are only one year old. While it appears that a fight may begin, the terrier assures the larger female of his intentions by his lovely body skills and soft mouth. Of the two, the terrier has more play experience than the larger dog. If you had only seen this photo, you may have been alarmed, but I can assure you that play followed for some time. The communication is endless from the female with ears back, soft eyes, lifted paw, leaning backwards, soft joints, open mouth with no teeth showing. One vital piece of information for her is that the terrier is not looking in her eyes, yet off to the side which is non confrontational. One friend is better than no friends! Does your dog enjoy running along the beach, digging in the sand, chasing the birds and playing with other canine friends? If so, GREAT, you have something your dog wants! This is a great opportunity for behavior training! Before you let them off leash to dash in any direction, how about asking for a few behaviors first? Developing good emotional control takes practice, by incorporating training into your daily routine, your dog will learn to comply in a consistent fashion. So why not ask your dog for a simple “wait” in the car while you attach a leash, a “sit” once out of the car, how about 3 or 4 sets of sit/stay while you hold onto a long 15 foot leash in safe areas of the parking lot? Ask for a few “waits” then call your dog “come” and reward! When on the beach, ask your dog to “wait”, remove the leash and say “go play”– for many dogs this is more rewarding than food! So use this awesome reward of freedom, to get your dog to comply to a few behaviors first! With practice your dogs will wait patiently like the 3 above! What I love about this photo is that both of these dogs LOVE people!! They frequently love to say hello to everyone they see but are using good emotional control here at Back Cove Trail! As you can see both dog handlers are asking their dog to make a choice, the dogs have learned that when they comply a reward is coming!! What reward? What ever the handler chooses is rewarding to their particular dog. Some dogs love play, affection, food, a good scratching, a special toy or even a good sniff in the grass can be rewarding to a particular dog! Many of you have asked me about interactive toys to help keep your dog busy when left alone. Below are some of the toys I use to create positive associations for many dogs in many different ways. For example, when I leave I often say “Kong Time” and leave each dog with a stuffed toy. The sound of a delivery truck is often another “kong time” as I want my dogs to be excited not fearful when this sound occurs. If I am training a foster dog to use a crate, I only feed them using these toys, and, again, happily say “crate,” and toss a yummy toy or two in the crate so the dog associates it with something good! These are simply a few ideas to help enrich your dogs life. Premier Tumble Ball, assorted Kongs, Everlasting Toys, Squirrel Dude, Planet Dog, Rip and Tug. To get started be sure to make the toy easy for your dog to receive a reward, otherwise they will lose interest. The balls are great for beginners using dry kibble mixed with a few treats. For the experienced dog, pack the Kong with a variety of goodies! For example, begin with a bit of peanut Butter, next add some raw meat or pieces of hotdog or cheese, followed by some kibble, dry treats, and repeat the process! It is like a party every time as your dog works hard to get to his favorite goodie! Be sure to use a cue like “kong time”, your dog will begin to salivate rather than pant when you are leaving! Scent work is an easy class that any dog can enjoy, all you need is your dog and his nose! Yes, I mean any dog, this is the perfect class for reactive dogs, shelter dogs, rescue dogs, dogs young and old can learn to use their nose and be rewarded for it! This is a wonderful enrichment activity, is easy for both handler and dog, and exciting to watch! Expect this class to be implemented this winter, perfect timing for some indoor fun!